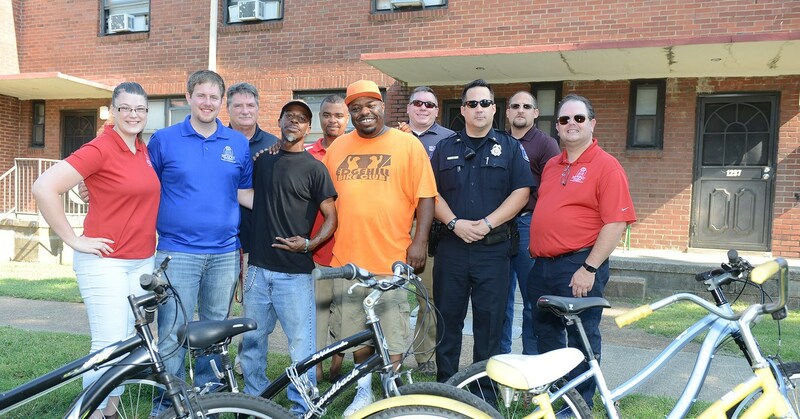 Belmont University police donate bikes to Edgehill community in Nashville, Tenn. September 9, 2016. Belmont Campus Security–in partnership with Residence Life and Facilities Maintenance Services–recently donated 30 bikes to the Edgehill Bike Club, an organization in the Edgehill neighborhood that aims to provide free bicycles to local children. The partnership began last year when Campus Security members donated 20 bikes to the organization. Security gathers the donation by collecting abandoned or forgotten bikes from racks across campus at the end of every summer. After sending out several notifications to current students in an effort to have the bikes reclaimed, they donate the ones that have been left behind to a local non-profit. Officers were referred to the Edgehill Bike Club by a similar program at the Oasis Center that usually receives the donation but had a full inventory. The Edgehill Bike Club, which “seeks to change lives one child at a time by combining the refurbishing of bikes with regular bike rallies and mentoring,” was created in 2013 by Terry Key in an effort to create crime-free communities. Key hoped to achieve this goal by educating and inspiring children and families living in disadvantaged neighborhoods to participate in active community-based programs.